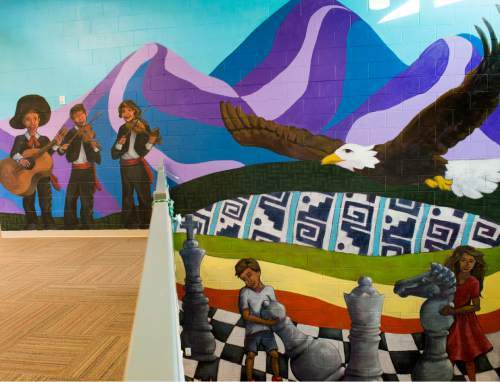 Rick Egan | The Salt Lake Tribune The University of Utah Special Topics Art Class and Professor V. Kim Martinez unveiled the1500 square foot mural at Esperanza Elementary School in West Valley City, Friday, December 11, 2015. Rick Egan | The Salt Lake Tribune Artists and teachers gather as University of Utah professor V. Kim Martinez unveiled an1500 square foot mural at Esperanza Elementary School in West Valley City, Friday, December 11, 2015. 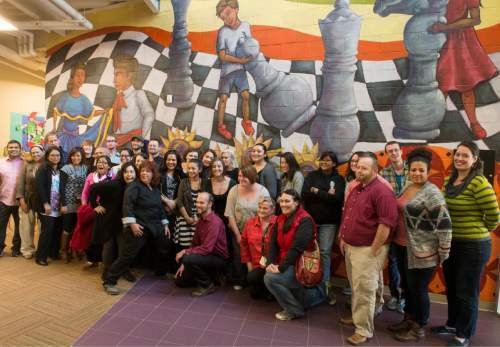 Rick Egan | The Salt Lake Tribune Artists and teachers gather for photo after The University of Utah Special Topics Art Class and Professor V. Kim Martinez unveiled the1500 square foot mural at Esperanza Elementary School in West Valley City, Friday, December 11, 2015. 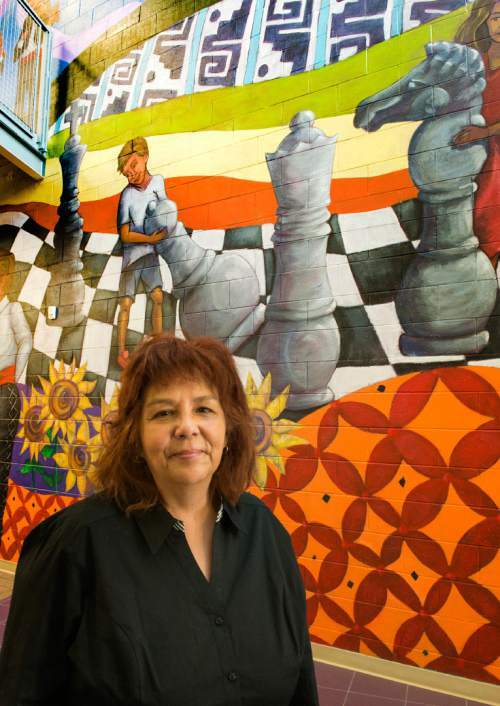 Rick Egan | The Salt Lake Tribune University of Utah Special Topics Art Class Professor V. Kim Martinez unveiled the1500 square foot mural at Esperanza Elementary School in West Valley City, Friday, December 11, 2015. 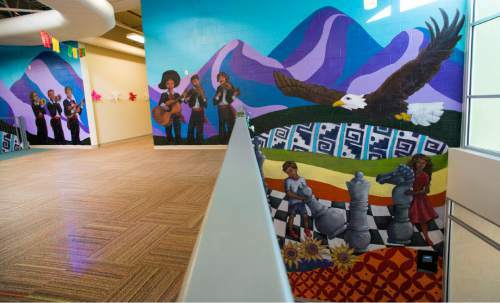 Rick Egan | The Salt Lake Tribune The University of Utah Special Topics Art Class and Professor V. Kim Martinez unveiled the1500 square foot mural at Esperanza Elementary School in West Valley City, Friday, December 11, 2015. 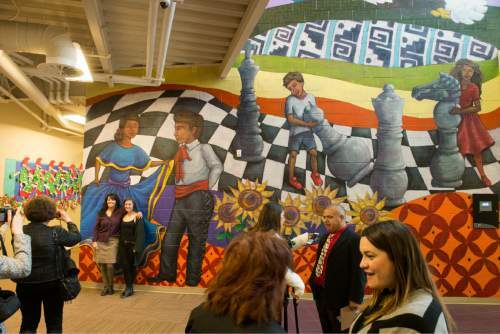 Rick Egan | The Salt Lake Tribune The University of Utah Special Topics Art Class and Professor V. Kim Martinez unveiled the1500 square foot mural at Esperanza Elementary School in West Valley City, Friday, December 11, 2015. Rick Egan | The Salt Lake Tribune Artists and teachers gather as University of Utah professor V. Kim Martinez unveiled an1500 square foot mural at Esperanza Elementary School in West Valley City, Friday, December 11, 2015. 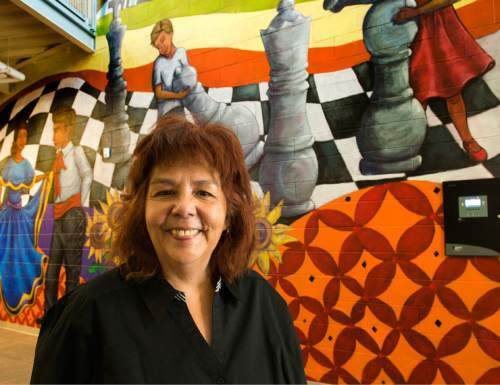 Rick Egan | The Salt Lake Tribune University of Utah Special Topics Art Class Professor V. Kim Martinez unveiled the1500 square foot mural at Esperanza Elementary School in West Valley City, Friday, December 11, 2015. The art of empowerment is on full display at a West Valley City grade school, thanks to a mural created and painted by a University of Utah art professor and her students. 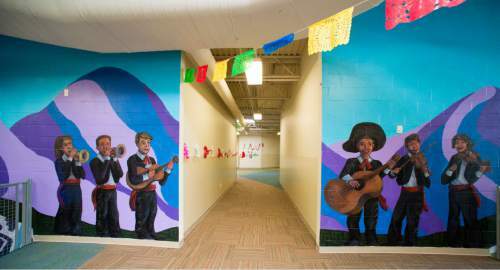 The 1,500-square-foot work, titled "Lenguaje de Esperanza" (Language of Hope), was unveiled Friday at Esperanza Elementary, 4956 W. 3500 South, a public charter school whose student body is nearly 98 percent Latino. 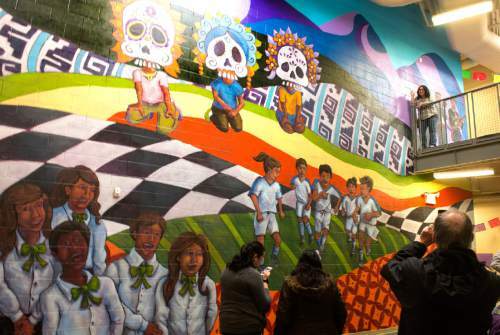 The colorful collaboration boasts a "tapestry of cultural narratives," according to a U. news release, reflecting the "interests, curricula, identities and loves of the students who inspired the mural&apos;s many themes: chess, sugar skulls, soccer, mountains, mariachi bands, sunflowers and folklorico dancers." U. art professor V. Kim Martinez, whose special topics class worked on the project, explained that the "goal of art and social justice is for communities to have agency over how art represents them." "Art is a right," she added in the release, "not a luxury." For his part, Principal Eulogio Alejandre sees the new mural in his school as culturally and socially empowering. "I never wanted to be in a school that tolerated culture," Alejandre said in the release. "I wanted to be in a school that celebrated culture. With this mural, we are letting kids know that their culture is valuable."